Photo: © Sanitation and Water for All. Sanitation and Water for All is a global partnership of governments with their development partners. It finds its origin in the UNDP Human Development Report 2006 “Beyond Scarcity: Power, Poverty and the Global Water Crisis”, and aims to stimulate political dialogue to promote multi-stakeholder decision-making that leads to more sustainable, efficient, transparent and equitable drinking water and sanitation solutions. In the past, high-level meetings of sector ministers and of ministers of finance, several in the margins of the World Bank Spring meetings, have resulted in important new commitments for WASH around the world. The Hon. Kevin Rudd, former Prime Minister of Australia, serves as the high-level Chair for SWA, and the partnership is led by its Executive Director Catarina de Albuquerque, former UN Special Rapporteur for the Human Rights to Safe Drinking Water and Sanitation. 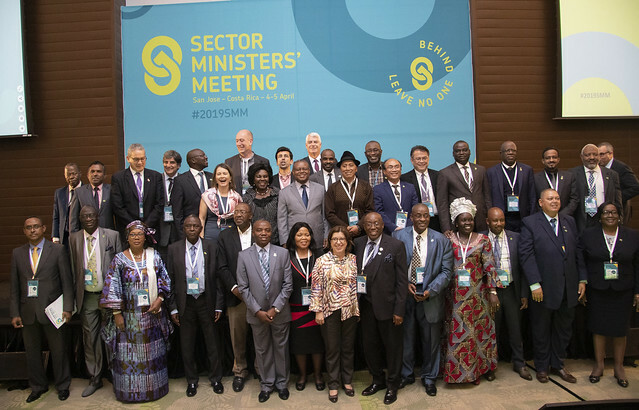 A Sector Ministers’ Meeting was organized in San José Costa Rica on 4 and 5 April 2019 addressing the Sustainable Development Goals’ basic pillar of leaving no-one behind, under the title: “WASHing away inequalities”. The sixth of its kind, the SMM meeting was attended by over 50 ministers (of drinking water/sanitation; of water resources; or, of health) who took decisions on action to reduce inequalities in access to safe water and adequate sanitation, made commitments to accelerate efforts towards achieving SDG targets 6.1 and 6.2, discussed financing mechanisms and focused on the urgent need to deal with wastewater management. The meeting was opened with a powerful keynote by the President of Costa Rica, Carlos Alvarado, who said: “For many years, people believed that water was an unlimited resource. Today we know it is not so. Our rivers and seas are sick, and this is happening around the world. In Costa Rica, one reality is that only 15% of the population is connected to the sewage system. The challenge is enormous, but we are facing it with responsibility in order to protect the health of our population.” He also informed the audience of Costa Rica’s policy to achieve a fully de-carbonized economy by 2050, referred to the concepts of co-responsibility and solidarity in matters of global climate change as well as in natural resource issues, including water and sanitation, and stated that in the 40,000-year timespan of human beings being on the planet, it fell upon this generation to rectify within the next 30 years the environmental damage done over the past century or so, before arriving at a point of no return. The meeting covered a range of issues in plenary keynote and panel sessions, and in three time slots for six parallel ministerial dialogues, covering equality, financial issues and overcoming constraints to progress. At the meeting, IWA was represented by Robert Bos, Senior Advisor, who in the plenary reminded the audience of the critical role of operators and regulators to reduce inequalities in access to drinking water and sanitation services. The IWA Manual on the Human Rights to Safe Drinking Water and Sanitation for Practitioners -whose Spanish version had just been launched at the 5th Latin American Sanitation conference in Costa Rica the previous days- points to the role of operators and regulators in giving shape to the enabling environment for a rights-based approach, in establishing the required institutional arrangements and to incorporate human rights principles and criteria into the policies and essential functions of utilities, other service providers and regulatory authorities. Experiences from IWA’s work with regulatory agencies was also shared at a thematic session during LatinoSan entitled “Regulation as a mechanism to achieve efficient, equitable and affordable services“, organised by IWA in coordination with CAF. The plenary panel of the session included Jaime Melo Baptista, former member of IWA Strategic Council and important instigator of IWA’s Lisbon Charter, Iván Lucich, President of SUNASS, Andrés Mendoza, President of EMAPAG-EP, and Carlos Orellana, Water Sector Specialist CAF. 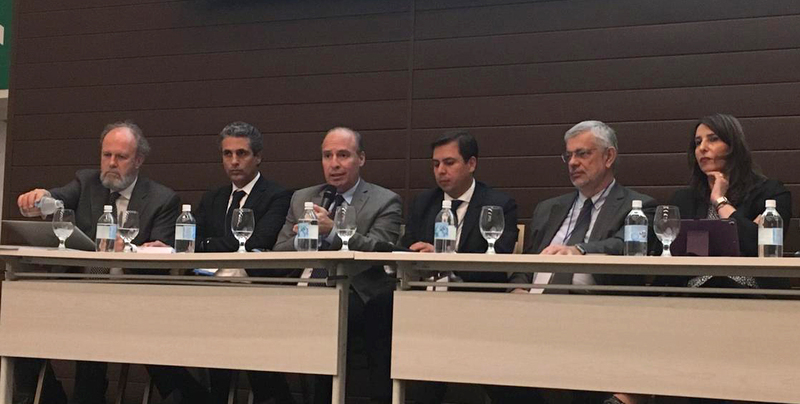 From left to right, Robert Bos, Senior Adviser IWA, Iván Lucich, President of SUNASS, Andrés Mendoza, President of EMAPAG-EP, Carlos Orellana, Water Sector Specialist CAF, Jaime Melo Baptista, Coordinator Lis Water. To learn more about IWA’s work on Policy and Regulation, contact Carolina Latorre.